Jetta Oliver was finally taking control of her own life. Daughter of rock legends who’d passed, former guardian of her now pop-princess sister – Jet could now focus on living only for herself. She sure as hell never expected a drug lord to emerge demanding a figure she had no way of paying. Swallowing her pride, Jet is forced to reach out to the one man who might be able to help her. The man who left her behind. I received this book as part of the Quirky Blind Date with a book, so as you can see I was going in to this one blind. In addition, I had no experience with the author. However, when I read the blurb up on receiving the book, it blew me away. It has most of the elements I look for in a romance. Second chances, suspense and wounded heroes. 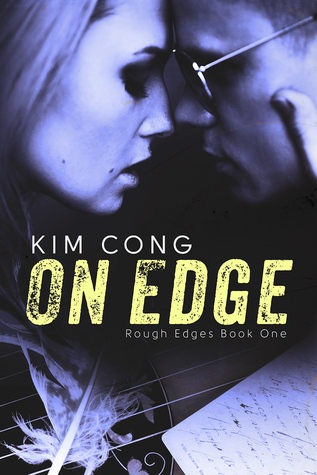 "On Edge", a second chance romance, is the first book in the Rough Edge series and can be read as a standalone. It tells the story of songwriter Jetta Oliver and wounded war veteran Paxton Elliott. Ten years ago, Paxton made a painful decision, which led to him leaving the love of his life on the day she needed him most. The day her parents died leaving her to raise her sister on her own. Forced to grow up fast as a result she forged a new path for her life. A life that involved her being a guardian to her younger sister. After ten years of not having any contact with Paxton, she had no expectations of ever seeing him again. However, the emergence of a drug dealer demanding that she pay up her father and sister’s debt would change all that. When Paxton discovered the danger that Jetta faced he was more than happy to assist. This was his chance to make amends for the hurt he caused. The moment they re-connected, it was evident that their feelings for each other never faded. The story with its engaging writing moved between the past and the present, which I considered a plus. This helped me to understand the choices made by the main characters even though I may not have agreed with most of them. It also helped that we get the story from the POVs of both characters. My problem laid with the pacing of the story. The focus of the story was on Jetta and Paxton’s past and current relationship and no mention was made of the issues surrounding the drug dealer until about 70% into the story. I related to Paxton and Jetta has individuals, but has a couple I did not find them credible. The fact that they jumped in to a relationship so soon after their re-connection did not sit well with me. I say this because they never addressed the issues of their past. These issues affected how they related to each other. Jetta’s behaviour also did not help. Sometimes she displayed shocking levels of immaturity, which was frustrating. In addition, the fact she did not trust him spoke volumes. The suspense theme, which I thought the author handled well, provided nail biting moments. It was at this point that the story lived up to its name. Figuring out the mastermind behind the danger surrounding Jetta was simple; however, the shocker laid in the motive. Although not perfect, I enjoyed ‘On Edge’ and look forward to the next book in the series.